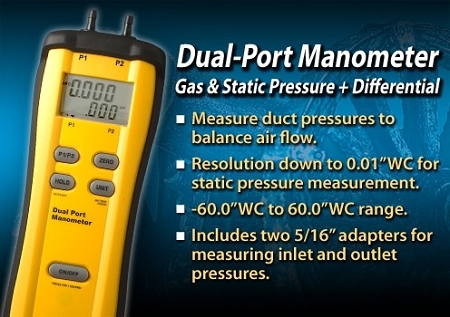 The SDMN5 is a portable, rugged dual-port manometer designed especially for HVAC/R field service technicians. Measures gas pressure, static pressure and pressure differential. The SDMN5 includes a zero adjust button of the face of the meter, a rugged rubber boot, a magnet on the back for hanging the meter during service, and the Auto Power-Off (APO) function conserves battery life. The SDMN5 measures pressure between -60inWC and 60inWC (inches of water column) and -150.0 to 150.0 mBar. The SDMN5 also measures P1 or P2 pressure readings and calculates the difference between P1 and P2. Take static pressure measurements using the resolution mode of 0.01inWC or 0.01mBar. Includes 3/16” to 5/16” adapter for measuring gas inlet and outlet pressures. Q: Usually Fieldpiece tools need a 2nd piece to work, this seems to be able to work as a single unit on its own? What is the difference between this tool and the higher priced manometers, its seems they all read the same thing, why hundreds of dollars difference in price? Inquiring minds want to know! Thank you, J. The big difference is the resolution. The smaller the resolution more accurate a manometer. 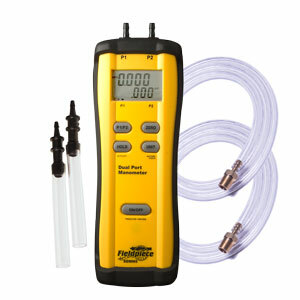 The second difference is, the higher cost manometer usually come with a certificate of calibratrion. Resolution examples from good to best* below. Was this answer helpful? 26 of 27 Customer(s) found this Answer helpful. Battery: Single standard 9-volt battery, NEDA 1604, JIS 006P, IEC 6F22. Battery Life: 200 hours with low battery indicator on display. Over range: "OL" or "-OL" is displayed. 128 TruReward$ points will be placed in your account when you buy this item.